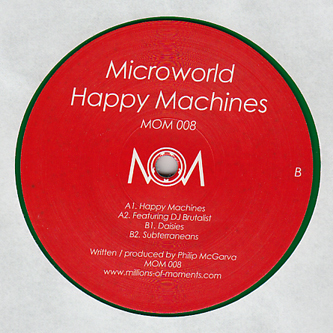 A lovely offering from techno anomaly Microworld, this time for MoM. He's only got a meagre handful of relases to his name, but each 12" bears a distinct stamp of driven-yet-lush characteristics. The four tracks investigate variations of pounding 808s countered a with bright and clean melodic shine,sometimes deviating from the 4/4 like on the electro-set 'Featuring' with DJ Brutalist or the sublime 'Subterraneous'. Sweet.